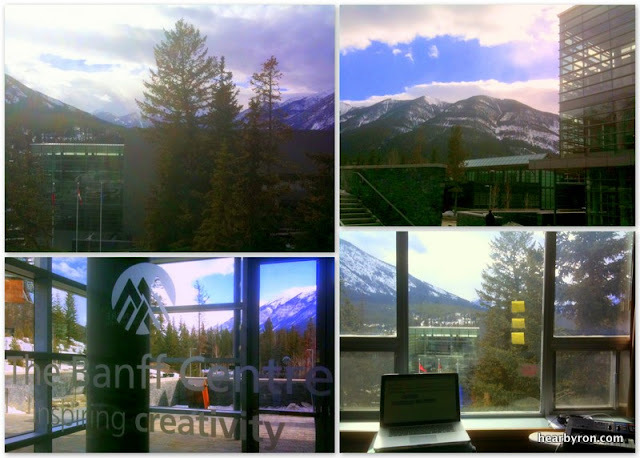 This is the second full day I have been at the Banff Arts Centre as part of the 2011 Sundance Institute Theatre Lab. Already, I have seen three deer: one from our rehearsal room window and the other two walking along the snowy paths. I have definitely been inspired to think differently about Stuck Elevator. Here's the view from my work area. A long ways from a stuck elevator in the Bronx, I find creativity and generosity with amazing collaborators, fellow theater artists and the support staff. The environment encourages me to expand the story and music in playful and unexpected ways.